The services that we include are cleaning, lining, maintenance and replacement, of all guttering types. We are able to provide new supply if the existing system is beyond repair. With Industrial guttering we can offer gutter cleaning included as a part of our package maintenance service. We have always been a committed organisation who gives all our dedication to our clients's roofing no matter what sector of the business they are in. At Premier Roofing Systems we ensure that we provide high quality services of cleaning and routine maintenance. Be it from commercial, retail and industrial property gutters. 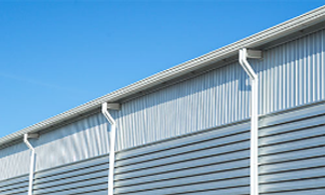 We have extensive experience in gutter repairs and cleaning in order to provide our customers with the best possible service for commercial gutter maintenance. Our mission is to work with qualified uncompromising workmanship and service as well, using both the latest technology and practical solutions. We uphold and always are eager to improve the standards of roofing in the UK. We always try to offer high levels of service. We offer a free site visit and survey, Continuous counsel and advice from our team, High quality material as well as the roofing workmanship on refurbished as well as new systems. Get in touch with us to discuss how we can help.